Samsung washing machine getting an error code? Here is information that will assist you in identifying what may be making your Samsung washer display an error code. Identifying what the error or fault code is will help you to repair your washer. The Samsung specific error fault codes below are to give you an idea as to what part is at fault. You may have to do further troubleshooting to find what may be causing the fault for that specific part. Google or YouTube to find the exact error code your Samsung is displaying. GE, Haier, Hotpoint, Kenmore, LG, Maytag, Samsung, and Whirlpool washers. Need assistance with finding an error code for your washer? Ask your question below and we will be happy to assist. i have a Samsung washer. it is showing an error of 7e14 i have already checked all hoses and no kinks, i have reset the washer no luck, still showing the error. what do i do next. Please help. I have a Samsung vrt top load washer and it always worked fine until one day I turned it on and when I did, it immediately powered off. It displayed a code of c6 I believe. It happened quickly. Then turned off and won’t turn back on. I’ve tried all troubleshooting tips I found online. But nothing. I did take check the noise filter and had it tested. Noticed that power is going in but not out to the main board. So could it be the noise filter? Please help , any info is appreciated . I have a new Samsung WW85K5410ww Add Door washing machine. Worked fine for the first 3 months. Yesterday I tried putting a load through and it won’t go further then the first 3 minutes. Starts to fill with water then just stops after 3 minutes. No error code showed up however after I turn it off then on again and do Smart Check, it comes up that the Add door is open. The Add Door is definitely closed, I have checked for anything that may be jamming it or the actual door but it looks fine. I have tried unplugging the machine, different cycles, checked the hoses etc. Called Samsung and they couldn’t help me. Any ideas? I have a front loading 9kg ecobubble wf90f5e5u4w Washing Machine. When the drum is on the ‘slow turning’ part of the cycle it does not turn. The drum turns freely by hand and it does not give an error code it just stops the cycle. I also slipped the belt off and the motor was not turning properly then either. So I think it must be either the motor or the drive circuit. The smart check function also says to check motor so I have checked connections on the motor and the main board (again it could be the motor or drive circuits at fault). It is the induction motor type so does not have brushes it is less than two years old so a total failure of the motor seems strange (i am another who did not register the warranty so Samsung won’t honour the 10 year motor warranty). Before spending a lot of money on a new motor any thoughts? I have an eco bubble 8kg and lately after each cycle, whatever the cycle or program used to wash, a red drum appears on the front panel. We only got our front old Samsung washer 3 weeks ago and it’s basically “frozen” on normal wash, displaying the error code “AE6”. How could it already be having error codes when it’s so new?! And what can I do? Samsung Washing Machine Error Code AE6 means = Communication error between INVERTER PBA and MAIN PBA. Check to be sure the wiring harness going to and from the main control panel outward are secure and not loose. If all wire harnesses are tight and in place, you may have a faulty board. Call the company you bought it from as there should be a warranty. Please assist my samsung washing machine is displaying a 4C error code. It seems to wash fine then does not spin. 2E error code on Samsung Dryer DV50F9A7EVW/A2. Samsung dryer error code 2E can usually be fixed by unplugging the washer for 10 minutes. This may reset it and clear the 2E fault code. If this does not work, you need to check the wiring harness from the mainboard outward. Be sure all wiring harnesses are secure. I have a Samsung washing machine WF1600NCW. I encountered “Uc” error code on display and learned that it is due to voltage surge. I waited until normal voltage arrives and machine started to operate normally as usual. 1) At Power On mode, while commanding programme in 63 minutes wash loaded normally with standard detergent and laundry, water comes into tub more than normally encountered before. OE error then displays in washing machine monitor leading to draining out of excess water automatically. 2) There is no water flow, while water supply tap is on, to the tub in Power Off mode. 2a) Possibly, rubber hose from bottom of tub to the side of water level sensor might be chocked and be freed by pushing air only by aforementioned mechanics. 2b) Possibly, water level sensor is blinking. Thanks for the reply Ian,Z. I had already checked the inlet valves for continuity and all tested good. Since my last post, I also order a new Control board thinking that may have been the problem since there was never an error code thrown.. However, I swapped the board and the exact same issue. I can hear the pump running however something is not telling the water inlet valve to open.. it will continue to run like this and you can not pause or stop it from the power or pause buttons, the machine has to be unplugged to stop it. Im wondering now if its the control panel. I have a Samsung HE front loader WF42H5400 AF/A2 that’s a couple years old. For some reason, its not getting water however its not throwing any codes… it will startup and you can hear clicking but no water… I checked the water supply and screens, all good, I ohm out the water inlet valves. All good, I checked the coin filter, all clean..
and you can’t turn it off, it just keeps running like it’s waiting to fill with water. It has to be unplugged to turn it off.. I left unplugged over night and it still does the same thing. Powers up, starts the cycle however no water. I did pull the cover off the control board and there is a red flashing light on the board however I don’t know if that’s a problem with the board or if the board is indicating a problem somewhere else in the system. Test the water inlet valves. Next be sure the wiring to and from the main control board are secure. If no go, replace damaged wire harnesses or replace the board. Samsung washing machine, every wash flashes ERR from the start continuously. Sometimes the wash still goes ahead regardless, other times it stalls and sits there. No error code, just ERR and constant beeping. Pressing pause can change the time of the wash for no reason. Tried unplugging but it just reverts to same. Hate any electronic washers for this reason. Be sure the actual board that is displaying the code ERR is connected securely. Check the wire harnesses leading to and from the board on your Samsung washer. My Samsung washing machine is not opening, it keeps on making the lock sound repeatedly until it will show DC1 error. it’s been like that for over a week now. I couldn’t retract the fabrics within. Please is there a way I can open it manually. Please reply ASAP. You most likely have a faulty door locking assembly. 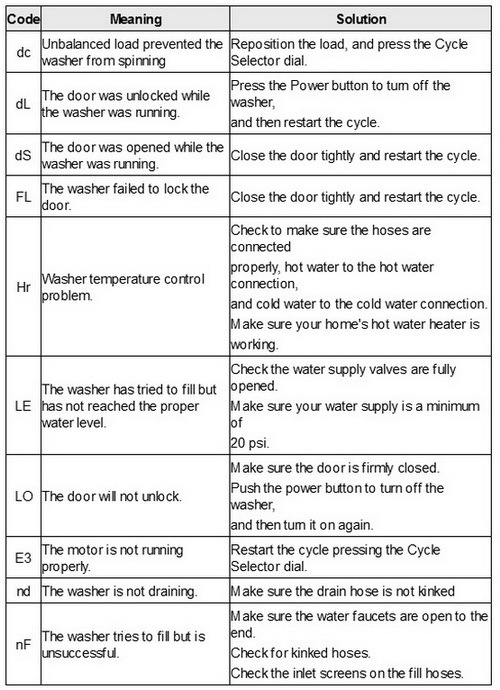 Here is a page to show you what to do in your situation about the Samsung washer DC error. To open the Samsung washer door if stuck or locked and the mechanism is faulty, Samsung front loaders have a small door located near the base that you can open and inside you should find an emergency pull release for the machine door. I have Samsung washing machine model-WA80V9. The machine is not operating and error code shows t01 also “spin” led glows. Some time machine is working, after long time switch off the machine. And it is not supplying water and now it shows the code pc, what does it mean? Wow I wish I did this sooner. I have a Samsung washer model # wa48h7400aw/a2 that I bought 2 months ago. It hasn’t worked yet, not once. After 7 visits from repair man it currently displays a PE code, any clue?? My gut tells me the devil’s in the details and it’s probably something that’s been stupidly over looked. Error Code PE on Samsung washer means = The control board is not detecting that the clutch motor is working properly. Usually there are not many control boards bad and the clutch motors are reliable. The problem is MOST LIKELY in the wiring. You will need a multi-meter to check the ohms and continuity. Test voltage going to the clutch. Voltage should be 120 vac. Check resistance through wiring harness to be sure the wiring is secure and not damaged. Check the wire connections between the clutch motor and the main electronic control board. Check for loose wires or replace the wire harnesses if damaged. If the wires check good then disconnect the clutch motor wire harness and measure the resistance between terminals 1 & 3. It should measure around 2,000 ohms. If you measure infinite resistance then replace the clutch motor. If the clutch measures infinite resistance it is broken. Parts that need checked or replaced: clutch motor & wire harness. I’m having this same problem. When I measure resistance at the wiring harness going to the stator with the machine unplugged I do not get a reading at all. Nor do I get anything close to 2000 ohms when I check resistance at the stator it self, just a very low reading…? My Samsung washing and dryer motor is not working and display error code 8E. The IPM controls the motor. However, during the dehydrating stage the signal is to be sensed, when the number of signals reads more than 6 per 500 ms during the Washing or Rinsing cycle action. During dehydrating, when the overload is sensed, the motor stops working at once and then feeds back to the initial stage of the dehydration unbalance sensing. When the feed back has occcurred twice, Error “8E” is displayed during the dehydrating unbalance sensing, No error happens by overload sensing. When it happens at more than 800 rpm, the process is stopped compulsorily. What is the Samsung Washing Machine error is U2? Do you happen to mean UE error code? There is no reference for the error code U2 for Samsung washing machines. Brand new, delivered today Samsung WA48j770a washer will not complete test run. Rinse and spin. Washer stops after rinse. Will not spin. Briefly showed code 8e. Unplugged, restarted. Same issue, no code. Just stops. Help! The 8e error means control board connection error. Make sure the wire harnesses from the main control board to the washer are secure. What should i do? My Samsung WM top load displays 1E any advice what can i do here thanks. If you see the words/letters “LE”, “Le”, “1e”, “1E”, “le”, “lE”, “Suds”, “SUDS”, or “sUDS” on the display, it is an indication of “oversudsing” or a water level error. This is almost always caused by using too much bleach, softener, detergent or non-HE detergent. However, this could mean there is an issue with the water level sensor. I have a top loader Samsung WA80V3. First it overflowed and I have checked the pressure switch and cleaned the draining hose, filter. Now its displaying 4E error when water reached its level. Its also not spinning when I put it on spin function to drain water. Check our page here for repairing and clearing the 4E error code on Samsung washers. I have a Samsung WA45H7000A/A2 top load washer. It displays the 4E code during a wash cycle, but will work perfectly through just a rinse cycle. I have check the hoses and filters and all are fine and have good water pressure. Any input would be great! Samsung 4E error means a water inlet problem or the machine cannot get water. Make sure the source water tap is turned on and check the water pressure. Turn the water tap OFF. Remove the water hose from the tap and dispense the water into a sink. Remove the entire hose. Check for Kinks. Check for Clogs. Check if water supply is good. Check, remove, and then clean the first mesh filter. Check and clean the second mesh filter. Test the unit by turning it on and by performing a normal wash cycle. My washer is a Samsung front loader and it won’t spin to finish the load what could this be it send out an error code. I can’t remember what the code is but it won’t spin the clothes. Does anyone know what this could be and what would I need to replace it? How much will it cost?? Please let me know. Without the error code we cannot be specific as to what part is bad or needs replaced. Can you run an empty load and see if the washer shows you an error code? Then let us know? Also, what is the model number of your Samsung washer? I don’t know what is going on? Can you help?? The Samsung error code D5 or DS is the same. The D5 error is actually DS. The code means the Samsung washing machine thinks the door is open or unlocked during the cycle. The door has to be checked to be sure it is shutting or closing correctly. Is it getting properly closed? The problem is related to faulty door locking assembly. You will need to check the door switch to confirm it is faulty. Let us know what you find. My Samsung washing machine WA82VNL model ‘6.5 kg top loading’ is facing a defect. The washing machine is continuously running. The timing while in operation in reducing from 28 mins to 5 mins but again goes to 20 mins and the cycle continues till the time i do not stop it. Seems there is some major issue. Can you help me? I have a Samsung top loader –Model number WA50F9A8DSP/A2. The water comes on to fill the tub when the start button is pressed and stays on through out the cycle. So even when the machine is spin drying the water is still running. Water goes off at the end of wash cycle and the drum is filled with water. The correct sequence for the past few years should be press the start button then select wash mode then hit start and the door locks and the machine starts the cycle and water shuts off once filled. Hi guys, i REALLY NEED YOUR HELP… I have the Samsung diamond drum WA80V3 top loader washing machine. My problem is that , when i start a load it wash and as soon as it must drain the water out to spin or rinse, it will give 5E error code. The ‘5E’ Error is displayed when the water is not draining properly from the Washing Machine. If the water doe snot drain in 15 minutes, a buzzer will sound, and the remaining time indicator will show ‘5E’ Error. Check all aspects of the washer drain pump, motor, and drain hose. Something is clogged and not letting the water drain out. Samsung front loader washer displaying UE after machine has been emptied. Have powered off machine left for 15 minutes and turned on. The UE message has disappeared but the display reads 200 and a red light and also a red light on the spinning icon. How do I clear and reset? Is it another problem that is suspension rods or other? If it is this is it an expensive fix? The Samsung washer UE error code indicates that the laundry load is unbalanced. If after emptying the washer more errors flash or appear, simply unplug the washer for 5 minutes to see if that resets it back to normal. If not please supply us with the model number so we may further research your issue. My dishwasher at the bottom is full of water it came up with an e3 error. Could you please tell me how to fix this problem? Samsung dishwasher error code E3 = Water Not Draining. Check to be sure nothing is blocking the bottom of the dishwasher such as pieces of food or other objects. Clean out the sump (bottom) of dishwasher. If you still get the error code, check the drain hose and drain pump to be sure the hose is not kinked or blocked and to be sure the drain pump is not blocked and is operational. I keep getting a the SE error code on the display and I don’t know what it means. Please help. It is most likely a 5E error code and not SE…. 5E error means clogged debris filter… Samsung Front Load Washers have debris filter access panels located on the front of the unit. The filter is housed inside of the drain pump to prevent the drain hose from being clogged. If not cleaned regularly, unpleasant odor, draining, and filling issues will arise hence the 5E error code. Clean the filter and the error code should clear. My Samsung washing machine shows 5C. What does that mean? Are you sure the error code is 5C or is it 5E? You may have a draining issue. Check drainage pump filter for blockages. Check drain hose and waste connection for kinks and blockages. The Samsung washer error code u6 indicates a faulty water level switch. Check the switch for clogs and be sure it is operating properly. It probably just needs cleaned. If you find that it is clean and free of blockage, it will need to be replaced. I just bought a Samsung front load washer 2 days ago and is not spinning it keeps giving me code error 5e what do I do? The Samsung washer ‘5E’ Error code is displayed when the water is not draining properly from the Washing Machine. If the water does not drain withing 15 minutes, a buzzer will sound and the remaining time indicator will show the 5E Error Code. To unclog the hose… Remove the drain hose from washing machine. Clean out the inside of the hose. Continue cleaning until the hose is no longer clogged. -Make sure the drain hose is not frozen. -Make sure the drain hose is installed correctly. -Be sure the drain pump is not clogged or blocked. My Samsung washing machine displaying an error bE3. Please inform me about this error and how I fix it. Samsung washing machine error code bE3 means a button is defective. This means a button needs replaced, unstuck, or the control panel components need replaced. Unplug machine and check control panel area for obvious signs of the problem. You may be able to fix the button yourself. Let us know what you find. I have an EA error code on my Samsung washer. Samsung washing machine error code AE means = Signal communication error between Main PCB and Sub PCB. Remove power to the washer and wait 30 seconds. Switch appliance back on again and start a new wash. This should reset the washer. I have top loader Samsung washer. When I do wash it fills with water then stops and the 4e code shows up. Anything I can do to fix this? Samsung washer 4E error code means a water inlet problem or the washing machine is not getting water. Make sure the source water is turned fully on and check the water pressure. Is your washer getting water? Is it turned on both HOT and COLD? Fully open? If so is the water inlet where the water goes into your washer clogged? Turn off water and remove hoses to be sure there is no clog. If the washer IS getting water and the hoses are not crimped and the water inlet is not clogged, let us know and we can assist to troubleshoot further. Checked to make sure the hot and cold are getting good pressure. Made sure the hoses have no leaks, kinks or clogs. The HOT and COLD are turned on and fully on. Replaced the water inlet valve. I tried different washes from Quick wash, normal wash, to rinse and spin. All fail. I have also completed a successful calibration on it. The washer starts, locks the door, begins the pre-wash (spray and spin drum), starts to fill both hot and cold. Gets about 10 minutes into the cycle with about 2 1/2 inches of water in the tub and then it throws a 4E error. Immediately it dumps the water and it takes about 10 minutes before you can power the washer off from the 4E error. If your Samsung washer gets the 4E error code, have you made sure the Water Hose Mesh Filters are clean? The error code 4E does mean the washer is having issues getting WATER supplied to it. This error will be released using Start/Pause button and the washing machine will restart and attempt to fill with water again. If you replaced the water inlet valve and you still get the 4E error code, there is still some type of water supply issue. It may sound simple but check the Mesh Filters as this is one of the main reasons a Samsung washer will get the 4E error. You may want to check the wiring coming from the Pcb and pressure switch and check the connections. Try opening the washer and clean the pressure bowl and pipes that run to the pressure switch. Samsung WF206BNW/XAA is not washing or spinning. If your Samsung front loader is not washing or spinning, at what point do you experience an issue? Does the washer fill with water? What exactly happens when you press the wash button and try to wash? Many times the door lock on a front loading washing machine will go bad or have a wiring issue and cause the washer to NOT WASH. Have you checked the door lock to be sure it is working properly? Here is a picture of the door lock for the Samsung WF206BNW/XAA washer. Can you explain in more detail what is happening with your washer so we may assist? I have a Samsung top loader washing machine for just over a year. I put it on the quick wash cycle and it fills with water but just about to spin and the UE error code jumps up and stops. Not sure what the problem is? The Samsung washer UE error code is telling you that the laundry load is not balanced. Try to redistribute the wash load as per the recommended chart here. If the door remains locked and the machine is displaying UE error, please run a drain program – select the spin button until it is on NO spin – either spin symbol with line or a zero. ERROR CODE 8C ON SAMSUNG ACTIVE WASH WHAT DOES IT MEAN CANNOT FIND IT IN THE MANUAL. The 8c or 8e error means there is a connection error. The problem is on the washing machine main circuit board. This usually means a new control board is required to fix the washer. Check the connections to the control board to be sure everything is connected secure. If so, a new control board will be needed to fix your washer. It now drains. However, the spin is slow and the slipping noise is still occurring. Is a belt accessible which I may check? You will have to open the washer up and check what is causing the slipping sound. If the spin is slow it may be a speed sensor or a part binding up in the washer itself. Unless there is a malfunction in the display light, it is “HC-76”. It originally appeared during the “Rinse” cycle. It would not drain completely but continued to the “Spin” cycle and would slowly turn clockwise and counter clockwise. At this point the is when I could hear the noise which sounded as if something was slipping. I did not smell any type of burning. It seems to go thru its cycle, however, the time display is at a slower than normal rate. Check the drain pump to be sure there is no blockage. Also check the drain filter and drain hose. If there is a drain blockage the washer won’t drain properly and therefore an error will appear and the washer will NOT spin. I have a Samsung washer (Model #WF330ANB/XAA01) which I have had for 5 years. I have been experiencing problems draining and spinning. It displays “HC76” which is not mention in the manual. I have run several of the modes and cleaned out any clogs as instructed. When I attempted to run a cycle, the drum will not rotate. It makes a sound as though something is slipping. I removed the back of the unit but without removing any further I do not see anything. Can you assist me? First, please recheck Samsung washer error code. Is it HC or HE? Does the washer fill and drain as normal EVEN THOUGH THE DRUM WILL NOT ROTATE? At what point does the error code HC76 appear? Do you smell any type of electrical burning smell or rubber burnt smell? Does the washer go through the cycles or stop and will not run. Please give more details so we may assist further. I have an ND error code message and water is not draining. Any thoughts? Your Samsung washer is NOT DRAINING = ND. Check the drain hose for bends, check the drain pump for clogs, check front filter and clean if needed (filter on front depends on model number of your Samsung washer). I get a PC code and washer stops working. If I calibrate the machine before every load it might finish the cycle. The machine is only a month old. Installers were back a second time to verify that the machine was level and connected properly. Called Samsung and they have no idea what the PC code means. Everything I can find tells me to check clutch. Any help will be appreciated. We would call the appliance company we bought it from and either demand a new machine or a skilled repair person to come and repair. Why are you working on a one month old washer? PC error code does not show for Samsung in our database. Are you sure it is PC? Also, what do you mean you have to “calibrate” the washer before each wash? Can you give us the model number of your Samsung washer? Samsung washer model #WF209ANWAR/XXA. I’m getting E3 error code. Checked the wires and they are all in place. Even unplugged it like one website said to do. I don’t know what else to do or what would need to be replaced. My husband was the one to look up the code and what to do to try to fix it. But he is not home and I would like to know what to do next? The 3E error code means a drive motor tach error. If you have already unplugged for 3 to 5 minutes and that did not help… Check the wiring on the drive motor and on the control board. Make sure they are secure and tight. IF so proceed next by checking the hall sensor. The hall sensor is in the back of the washer. It monitors the speed and tub direction. The sensor can be out of range or it could also have a bad wiring connection. This washer Samsung WA400 goes unbalanced with or without clothes in it. Thinking the suspension rods and springs need replaced. I have a Samsung WA400 that goes into an unbalanced condition and gives a DC error code. It will only spin for four minutes. Any help would be greatly appreciated. Do you believe the machine is actually seeing a true unbalanced wash load or the washer is sensing a false unbalance? Is the issue constantly happening or is it every now and then? Are you overloading the washer or washing large items like blankets or towels? Here is a Samsung washer DC error video to let you see what Samsung suggests. Just replaced the pump in my Samsung front load washer 2 months ago. It worked fine and then we moved and now it’s throwing an E2 code. Any suggestions would be appreciated. If your Samsung washing machine is flashing or displaying the E2 error code, the control panel is most likely needing to be replaced. This error code indicates the computer senses a stuck or shorted key on the keypad. The key pad is actually a user interface PCB control. Our Samsung washing Machine WD8602R8W is not working. It is not showing any error code. When we push the button to start it, it’s stuck and shows the sign of a lock (not the child lock) simply the photo of a lock. Will be pleased if someone can guide to solve the problem. Is the door locked and will not open? You may have a door locking mechanism fault. Check wiring harnesses and test door lock with meter. Have you tried unplugging the washer for 5 minutes? I have a Samsung with yo the 5E error too. I have checked and cleaned the debris filter an have the drain hose now going directly into the tub. A bit of water comes out the drain hose as it tries to drain but I suspect not enough. Still getting the 5E error when I try a rinse and spin. Either get a new drain hose or reposition it and secure it so this does not happen. If the drain hose is NOT the issue, you may have a clogged drain pump. Check drain pump for debris. My washing machine is showing a SE code and wont drain water it washes and then just stops and wont drain water. Clean the debris filter. Make sure the drain hose is not clogged. Make sure the drain hose is installed correctly. I have a top loader Samsung VRT washer and I am getting the error 3E.. Is there anything I can do to reset machine or is this a lost cause and have to call for repair? Disconnect power for 15 minutes. Plug the washer back in and machine should be reset. If this does not solve your problem and this happens again, please try to see what the full error code is. You could take a picture and email it to us if needed. On my samsung washing machine wf410anr, what is the error code f409 mean? Are you sure the error code is F409? What is going wrong on your washer? Please give a detailed description. I am having a problem with the Samsung Front Loader washing machine – WF856U4SAGD. Initially I get the 5E error, then I check the water pump and clean everything………..it’s ok but now I get the 4E error, what shall I do? You may have a water inlet problem or the machine cannot feed itself with water. Check to be sure both hot and cold water is on. Check for kinks. If this is ok, you may have an issue with the water inlet valve. Check to be sure all wiring harnesses are tight and secure. Does your washer fill with water? Does the washer display the 4E error code at initial start of wash cycle? Hi my Samsung top loader washer is send a code 8c and is also not draining very fast. I’ve check the drain line it seem ok. Does anyone have any idea what wrong with it?